Mix the flour, butter, and splenda. The mixture will be crumbly. Spread into 9 inch x 13 inch baking dish. You may see the bottom of the dish. That's ok. Doesn't need to be a thick covering on the bottom; just even. Bake at 375 degrees for 15 minutes. Let cool. In a large bowl, mix pudding and milk until semi-thick. Add cool whip, cream cheese, and powdered sugar. Spread pudding mixture over cooled crust and refrigerate for several hours before enjoying. You can also freeze (pull out of freezer 30 min. before enjoying). 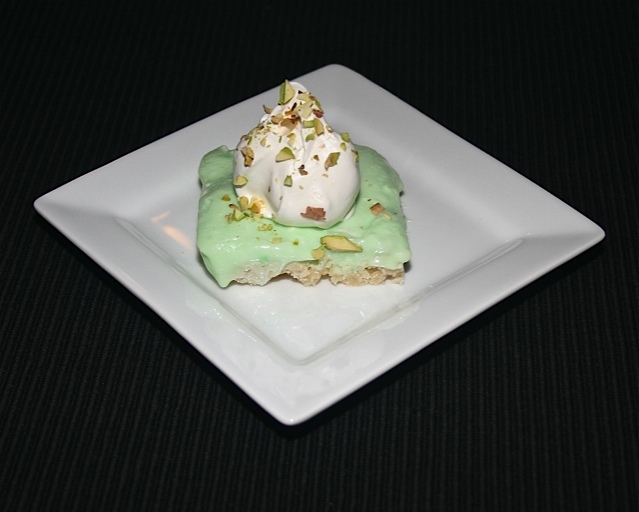 Add a dollop of cool whip to each serving and sprinkle with crushed pistachios if desired. If you'd like a printer-friendly version of this recipe, Click Here. NOTE: This dessert would also be good without the crust. Make the same way minus the crust mixture, and spoon into little bowls. Each serving would be 1.5 points without the crust.